Ionic and molecular carriers of dissolved (filter-passing) zero-valent sulfur (S0) in anaerobic natural waters include polysulfides, Sn2−, molecular S8(aq), organic macromolecules and certain higher valent thioanions. Because S0 is rapidly transferred among these various carriers, its biogeochemical roles in such processes as dehalogenation of organic compounds, chelation of trace metals, and anaerobic microbial metabolism are not determined solely by one ionic or molecular species. Here, S0 is treated collectively as a virtual thermodynamic component, and computational as well as graphical methods for quantifying its activity (aS0) in natural waters are presented. From aS0, concentrations of the ionic and molecular carriers of S0 can be calculated easily. Concentration ratios of any two polysulfide ions define aS0 (Method I). Unfortunately these concentrations are often too low in nature for accurate quantification with current methods. Measurements of total divalent sulfur (ΣS-II), zero-valent sulfur (ΣS0) and pH provide a more widely applicable approach (Method II). Systematic errors in ΣS0 measurements are the main limit to accuracy of this method at the present time. Alternative methods based on greigite solubility and potentiometry are discussed. 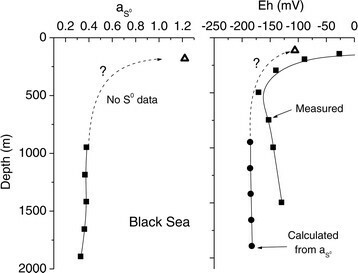 A critical comparison of Methods I and II reveals inconsistencies at low ΣS0/ΣS-II that imply errors in the thermodynamic data for HS2− and S2−. For samples having low ΣS0/ΣS-II, an interim remedy is recommended: letting pKa2 = 6.3 for all HSn− ions. Newly assembled data for aS0 in a selection of anaerobic natural waters indicate that S0 is always metastable in the surveyed samples with respect to disproportionation to sulfide and sulfate. In all the surveyed environments, sulfur-rich minerals, such as greigite, covellite and orpiment, are stable in preference to their sulfur-poor cohorts, mackinawite, chalcocite and realgar. The aS0 values in the dataset span conditions favoring Hg-polysulfide complexes vs. Hg-sulfide complexes, implying that aS0 could affect Hg-methylation rates in nature. No support is found for the common assumption that aS0 = 1 in reducing natural waters. This paper calls attention to an urgent need for improved measurement methods, especially for total zero-valent sulfur, as well as new determinations of ionization constants for all HSn− species. In aquatic and sedimentary environments, sulfur cycles in a series of steps between the +VI (SO42−) and –II (H2S/HS−) oxidation states. The reductive part of this cycle (+VI →-II) requires biological mediation at earth-surface conditions and is believed to be accomplished intracellularly with little extracellular leakage of the intermediates in most cases . In contrast, the oxidative part can occur via multiple abiotic and biotic pathways that progress through various dissolved intermediates –. The most commonly reported intermediates are zero-valent sulfur, thiosulfate (S2O32−), and sulfite (SO32−) –. In aqueous solutions, dissolved molecular zero-valent sulfur occurs almost entirely as S8. If (and only if) free sulfide is present, dissolved zero-valent sulfur will be found also in polysulfides, HxSnx-2 (x = 0 to 2, n = 2 to >8). In principle, zero-valent S can occur in polythionates (O3SSnSO32−, n ≥ 0) and in organic polysulfides or polysulfanes (RSn−, RSnR’, n ≥ 2), but in most sulfidic natural waters these contribute negligibly to total dissolved zero-valent sulfur (ΣS0) ,. Here, S0 designates a virtual thermodynamic component, analogous to e−, which is the conceptual basis of the well-known pE scale. The standard state for the S0 component is chosen so that aS0 = 1 at any temperature and 105 Pa pressure in a system at equilibrium with rhombic sulfur. Then, aS0 > 1 implies supersaturation and aS0 < 1 implies undersaturation of the system with rhombic sulfur. The value of aS0 is not linked to the concentration of a specific ion or molecule in solution. Instead, it is a continuous thermodynamic property that is controlled collectively by the assemblage of ions and molecules that participate in rapid, reversible S-atom transfer reactions. Consistent with much qualitative earlier evidence , Kamyshny et al. demonstrated that S-atom transfer among polysulfide ions occurs with a characteristic equilibration time of ~10 s. Consequently, polysulfide species can never stray far from equilibrium with one another in the laboratory or the field, and the value of aS0 will always be physically well-defined (buffered) in solutions that contain polysulfides as the dominant S0 carriers. In this respect, aS0 differs from ae− (i.e. 10–pE), which can be poorly defined in both in the laboratory and the field because e−-transfer reactions are often sluggish, and various redox couples in natural waters can be far from equilibrium with one another ,. As discussed in more detail in Section A of the Additional file 1, buffering of aS0 in an aqueous phase by rapid equilibration among polysulfides does not imply or require that polysulfides equilibrate rapidly with particulate phases of sulfur; indeed, owing to slow heterogeneous equilibration rates, the value of aS0 in the aqueous phase of a rhombic sulfur suspension is not necessarily unity. Knowledge of aS0 in natural waters is important primarily for two reasons. First, aS0 itself influences the behavior of other elements in nature and constrains the metabolic energy available from microbial oxidation, disproportionation or reduction of zero-valent sulfur. The electric potential available from seafloor fuel cells also depends among other things on aS0 in pore waters . Because of reactions of this type, higher valent thioanions of As and Sb, just like polysulfides, must be regarded as carriers of S0 in solution. Notice that addition of one S0 atom to the non-bonding electron pair in As(III) accomplishes the equivalent of a 2e− oxidation, making S0-atom transfer an alternate redox mechanism to e− transfer. The second principal reason why knowledge of aS0 in natural waters is needed is that along with pH and aHS–, it can be used to predict polysulfide chain length distributions. An example of chain length’s importance is its effect on trace metal chelation by polysulfides; only Sn2− ions having n ≥ 4 are able to form chelate rings. In sulfidic waters, chelation by polysulfides is likely to influence strongly the mobility, bioavailability and toxicity of Class b, or soft metal cations (Cu+, Ag+, Au+ and Hg2+) ,–. Another example involves polysulfide-dependent kinetic processes. Explaining the reactivity of polysulfides requires accounting for variations in chain length in response to solution composition . Polysulfide reactivity can control lifetimes of many xenobiotic organic compounds in anoxic environments –. Previously, a convenient graphical approach for determining aS0 in laboratory and field samples was presented , but this graph is out of date because of major revisions of the thermodynamic data –. The goals of this paper are threefold: 1) to review computational methods and to update graphs for estimating aS0, 2) to survey current information about aS0 in modern sulfidic water bodies and 3) to explore briefly what this information might imply about biogeochemical processes. Where [x] and ax respectively represent the molar concentration and activity of species x. Based on this equation, Figure 1 graphically presents relationships between aS0 and ratios of those polysulfide ions that are usually most abundant and thus most easily measured. Relationship of a S 0 to ratios of polysulfide ion concentrations. The hatched region demarks aS0 values that are unattainable, except transiently, because rapid precipitation of inorganic colloids occurs. The curves are independent of pH provided pH is high enough that polysulfide ions are not appreciably protonated. If aS0 indicated in Figure 1 falls inside the hatched area (aS0 above ≈ 1.22), then the sample is supersaturated with respect to colloidal sulfur, which will precipitate at least initially as nanoscale, supercooled droplets of liquid sulfur ,. The value of 1.22 is based on an experimental determination of the solubility of colloidal sulfur . Older experiments that defined the kinetic threshold for rapid colloid precipitation suggest a similar value . The true position of the colloid boundary in natural waters is somewhat uncertain owing to the possibility that natural organic macromolecules could affect its position. Additionally, the temperature and colloid-size dependences of this boundary are not known. It should be emphasized that aS0 < 1.22 does not prove absence of colloids. Colloids have been observed in highly dynamic systems when aS0 < 1.0 . Possibly these colloids were produced by bacterial sulfide oxidation, which generates colloidal sized, chemically stabilized S0-containing substances that are less soluble than abiotic colloids ,,. This approach to quantifying aS0 is attractive because activity coefficients of the polysulfide ions reasonably can be assumed to cancel, as done in equation 4, making ionic strength irrelevant. Furthermore, the Kn+Δn/Kn ratio changes slowly with temperature, so in many cases temperature also can be neglected. When aS0 has been determined from equation 4, back substitution into equation 3 yields aHS-, and these two quantities in turn enable calculation of all polysulfide ion concentrations as well as the concentration of S8(aq) in a sample of known pH, ionic strength and temperature. On the other hand, a weakness of this method is its sensitivity to analytical error, as discussed later. In practice, this approach has enjoyed only limited application, because in many samples individual polysulfide concentrations are too small for direct quantification. Method II. Estimating a S 0 from measurements of pH, ΣS 0 and ΣS -II . A more widely applicable approach employs thermodynamic modeling based on measurements of pH, total dissolved inorganic sulfide (ΣS-II) and total dissolved zero-valent sulfur (ΣS0). Computational methods for implementation of this method have been described previously ,,. A description of the approach is given in the Additional file 1, Section B. If S8 and all polysulfides are in equilibrium with one another owing to rapid S-atom transfer reactions, then equation 5 expresses the relationship between dissolved ΣS0, aHS-, and pH. Here, γ q represents the ionic activity coefficient of a species having charge ± q); γo, represents the activity coefficient of an uncharged species such as dissolved molecular S8 or H2Sn, and the various stability constants are defined in Section C of the Additional file 1. The first term in brackets in equation 5 accounts for dissolved (filter passing) S8 both in true solution and physically sorbed to filter-passing organic macromolecules (DOC). Owing to its hydrophobic character, S8 is expected to associate physically with dissolved organic macromolecules just as hydrophobic pesticides and similar compounds do ,. The second term is not meant to account for covalently bound organic S, which usually is excluded from dissolved ΣS0 by the analytical procedure. Probably, the second term oversimplifies the mechanisms by which DOC can affect S0 behavior, but it represents a reasonable description given the current level of knowledge. Synthetic surfactants at concentrations above their critical micelle concentration (CMC) are known to solubilize S0 in the same way that they solubilize fats . This mechanism is neglected in Equation 5 because current estimates of the CMC for natural organic matter  suggest that DOC rarely achieves sufficient concentrations to form micelles. This equation can be solved for aS0 values at a given temperature and ionic strength from only two input quantities, pH and the measured ΣS0/ΣS-II ratio. In consequence, 2-D contour plots suffice to present graphical solutions, as done in Figures 2 and 3. (Enlarged versions of these figures are given in Section D of the Additional file 1 for the convenience of readers who might wish to use them to obtain quick approximations of aS0 in field or laboratory samples.) Estimates of aS0 open the way to computing [S8] and the concentrations of all polysulfide species very easily by back substitution into equation 6 and the equilibrium constant expressions. If this procedure reveals that [S8] is not negligible relative to measured ΣS0, then the approximation inherent in equation 7 is invalid, and aS0 must be obtained by a full numerical solution of equations 5 and 6. Graphs for estimating a S 0 at 25°C; ionic strengths of 0.65 and 0.005. Curves are constant pH contours covering pH 6.0 to 9.0 at 0.2 pH unit intervals. Graphs for estimating a S 0 at 10°C. Currently, the accuracy of Method II is probably limited chiefly by problems in measuring ΣS0. Method II will overestimate aS0 if the ΣS0 analysis includes contributions from species other than polysulfides and S8 in its free and DOC-sorbed states. Colloidal S0 is a potential problem in most analytical approaches . Colloids are apt to be more problematic in fresh than saline waters, because hydrophobic particles coagulate rapidly under saline conditions . In fresh as well as saline waters, artifacts due to colloids can be minimized by using dialysis sampling methods . Critical comparison of Methods I & II. In a recent study of ground water from wells in Israel, three to four polysulfide ion concentrations were measured directly, and ΣS0 was measured by three independent approaches . This rich data set affords an extraordinary opportunity to test Methods I and II against one another and to explore uncertainties. 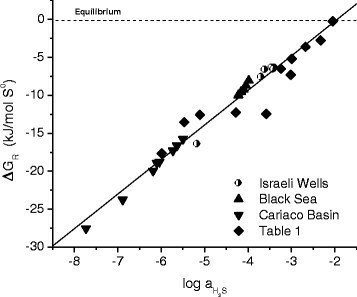 Two wells (Kfar Urya 8 and Tzofar 221) were selected because three independent measurements of ΣS0 in their waters were reasonably consistent and because their waters differed greatly in ΣS0/ΣS-II ratio. In Section E of the Additional file 1, aS0 as well as the concentrations of S8(aq) and a number of HxSnx-2 species have been calculated in multiple ways for the two wells using alternate choices of input data. For Kfar Urya 8 water, in which ΣS0/ΣS-II = 0.2, Additional file 1: Table S-2 reveals a level of agreement in the output from the three models based on Method I and the three models based on Method II that seems reasonable in the light of analytical uncertainties. On the other hand, Tzofar 221 waters, which had ΣS0/ΣS-II = 0.009, yield wildly discrepant values from seven independent models. The problem with the Tzofar 221 data is illustrated in Figure 4A based on the numerical values in Additional file 1: Table S-3A. The desired pattern in Figure 4 would consist of nearly horizontal lines connecting roughly identical concentrations calculated from each of the seven speciation models tested. The actual pattern is quite different. Values of aS0 range from 2.04 by Method I using S72− and S62− concentrations as input down to 0.13 by Method II using ΣS0 determined by cyanolysis and ΣS-II determined by methylene blue. Because of this large range in aS0, ΣS-II calculated by Method I ranges from 3000 to 10 μM, compared to the actual value of 770 ± 38 μM determined by methylene blue. Similarly, ΣS0 calculated by Method I ranges from 166 down to 22 μM, compared to actual values from 11 to 4 μM determined by three independent analytical methods. The concentrations of S42−, S52−, S62− and S72− calculated by Method II using chloroform extraction and cyanolysis data for ΣS0 are uniformly below 0.01 μM whereas actual values measured by methyl triflate derivatization are more than 10-fold higher. Clearly, at low ΣS0/ΣS-II these thermodynamic models have gone seriously awry; for some variables, the alternate models are inconsistent at the order of magnitude level. Comparison of output from four Method I and three Method II models. Data are from  for the Tsofar 221 well (pH = 6.81, I = 0.041, T = 38°C). 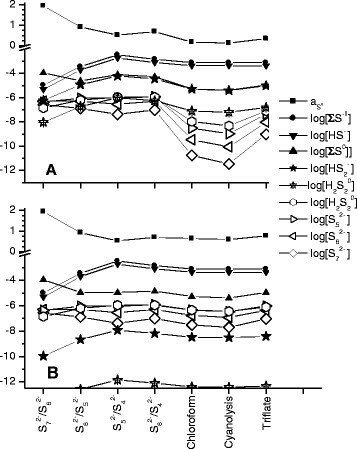 Labels on the horizontal axis indicate the choices of input data for each of the seven calculations; different pairs of polysulfide species were used in the case of Method I. ΣS0 values measured in different ways were used for Method II (the same ΣS-II was used in all Method II models). In the upper graph, thermodynamic data used in the computations were taken from – for S8(aq). In the lower graph, pKna1 for all H2Sn0 species was set to 3.0 and pKna2 for all HSn− species was set to 6.3. Numerical values on which this figure is based are given in Table S-3. Close inspection of the results reveals two general problems. The first lies in the thermodynamic data. 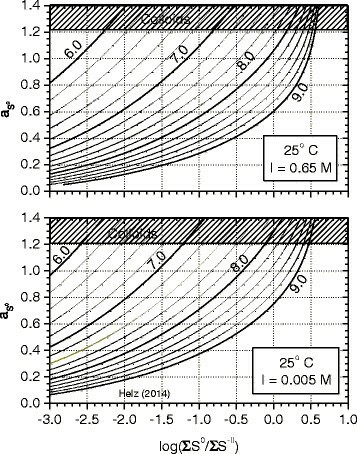 It is apparent from Figure 4A that concentrations of HS2− and H2S20 are much too large and dominate dissolved ΣS0 at near-neutral pH when ΣS0/ΣS-II is very low. In Method I, where S42− to S72− concentrations are constrained by measurements, the effect of this is to make calculated ΣS0 values too large relative to measurements because of the additional S0 contained in HS2− and H2S20. In Method II, where ΣS0 is constrained by measurements, high HS2− and H2S20 concentrations force aS0 downward and make concentrations of S42− to S72− much too small relative to measurements in order to preserve the ΣS0 molar balance. That thermodynamic data for HS2− and H2S20 might be problematic should not be surprising. Current free energies of formation of HS2− and H2S20 rely on a ΔGf0 value for S22− that has much greater uncertainty than for the other Sn2− ions . They also rely on pKa values that were not measured, but extrapolated from measurements on S42− and S52−. In the extrapolation, pKa values were correlated to reciprocal chain length, n−1, where n is the number of S atoms in HxSnx-2 species. This extrapolation method is thrown into doubt by a recent theoretical study which suggests that correlation to n0 would be more appropriate . Correlating pKa values to n0 rather than n−1 lowers the ionization constant of HS2− by about four orders of magnitude, greatly diminishing the stabilities of both HS2− and H2S20. In Figure 4B, pKa2 for all HSn− species has been set to 6.3, the average of the measurements for S42− and S52−. This choice is consistent with the finding in  that pKa2 values are nearly independent of n, but it is inconsistent with the finding in the same paper that pKa2 ≈ 9.4 at all n. Such high pKa2 values are rejected here because they contradict experimental evidence ,. Figure 4B and Additional file 1: Table S-2B show that greatly improved agreement is achieved with this pKa change; only the first two Method I models remain in substantial disagreement. The second general problem, which explains the remaining disagreement, arises simply from analytical error associated with Method I. In Additional file 1: Table S-4, this is demonstrated by error propagation calculations. It is clear in that table that the precision achieved by Method II is far better than the precision achieved by Method I. However this conclusion must be qualified in two ways. First, Method I precision is impaired in this example because the concentrations of individual polysulfide ions were not far above their detection limits, and thus subject to large relative analytical uncertainty. Method I can be expected to perform better in samples having ΣS0 substantially above 10−5 M. Second, the excellent precision (a measure of random error) of Method II in this example ignores the above-mentioned systematic error in ΣS0 determinations. As shown in Additional file 1: Table S-3 (and more extensively in ), ΣS0 measured by alternate methods varies by nearly 4-fold, giving rise to a similar range in most of the concentrations calculated by Method II. This large range in ΣS0 lies outside reasonable estimates of measurement uncertainty, testifying to existence of systematic errors in determinations of ΣS0. Kamyshny and coworkers , have used a modified Method I approach to calculate what they call the relative saturation level (RSL), which is identical to aS0. They controlled the analytical error problem by a weighted regression method that combines data from several polysulfide ion ratios. For Tzofar 221, their value for RSL (aS0) is 0.70 ± 0.12, which agrees within uncertainty with 0.63 ± 0.02 by Method II using ΣS0 from chloroform extraction (Additional file 1: Table S-4) or 0.59 ± 0.03 using ΣS0 from cyanolysis. Improvements in measuring ΣS0, as well as in pKa data for polysulfides, are urgently needed. However until better measurements become available, assigning pKna1 = 3 and pKna2 = 6.3 uniformly to all polysulfides seems to be a pragmatic remedy for the disagreement demonstrated in Figure 4. This remedy has been adopted throughout this paper, including in Figures 2 and 3. The entire thermodynamic data set on which calculations in this paper are based is given in Section C of the Additional file 1. Possible Other Approaches. Considering the uncertainties in both Methods I and II, it is prudent to search for additional phenomena that might be used to check aS0 values. The aS0-sensitivity of greigite solubility offers one possibility. Fe(III)-bearing particles that settle into sulfidic waters release dissolved Fe(II) owing to reductive dissolution. Consequently dissolved Fe(II) concentrations usually increase with water depth until saturation with respect to an Fe-sulfide phase is reached. Below the depth of saturation, Fe(II) usually declines as sulfide continues to rise. Thus in euxinic (sulfidic) waters (i.e. ΣS-II > ΣFeII) the horizon where saturation is reached can be recognized by a maximum in the dissolved FeII concentration profile . (In ferruginous waters, where ΣFeII > ΣS-II, sulfide reaches a peak at the saturation horizon instead of Fe.) Mackinawite (tetragonal FeS) is believed to be the first iron sulfide to precipitate in sulfidic waters , but if ambient aS0 in the saturation zone is high enough, mackinawite can transform to greigite (cubic Fe3S4). Unfortunately, the cubic exponent in this equation causes aS0 to be very sensitive to analytical uncertainty in QFeS. Additionally, the value of Kgreig is poorly known. The only previous estimate gave log Kgreig ≈ 2.6 based on the supposition that aS0 = 1.0 in the solutions under study . It has been suggested that this Kgreig is too large because the material studied may have contained mackinawite impurities . Aside from these problems, not all sulfidic waters come to equilibrium with greigite. It must be kept in mind that mere presence of greigite does not prove equilibrium. Intracellular greigite is purposefully synthesized and used by magnetotactic bacteria , which seem able to do this even when surrounding waters are undersaturated with this mineral. In the Cariaco Basin, sub-nanomolar concentrations of particulate greigite are detected at depths as shallow as 30 m (Supplemental Material for ), even though free sulfide is not detected until about 260 m and even though the dissolved FeII maximum that probably signals true saturation with an Fe sulfide mineral is found at 400 m. At 400 m and below, log QFeS is reasonably constant, as would be expected in greigite-saturated waters of roughly constant aS0. From published and archived data on the Cariaco Basin ,, aS0 can be estimated by Method II from the chemocline at 260 m to 400 m (taking dissolved ΣS0 to be the difference between reported total S0 and particulate S0 values). Unfortunately S0 data are not available below 400 m. However, at 400 m and below, where greigite saturation is inferred, aS0 can be estimated by equation 15. 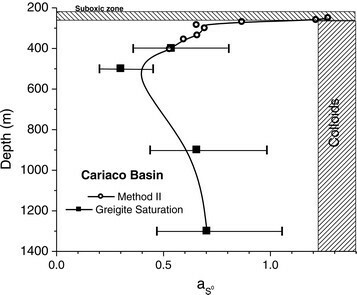 Figure 5 shows a spliced aS0 profile for the Cariaco Basin. To obtain agreement at 400 m, it was necessary to adjust log Kgreig to 2.24, a reasonable value but slightly lower than Berner’s value of 2.6 . 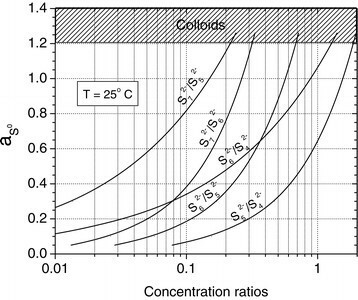 The figure shows that aS0 reaches the limit of colloidal S0 saturation in the suboxic zone where sulfide oxidation processes are rapid . Below the suboxic zone aS0 declines to values on the order of 0.5. Activity of zero-valent sulfur vs. depth in the Cariaco Basin. From 250 to 400 m, aS0 was calculated by Method II using data from an April 2007 cruise ; salinity = 36.3 and T = 17.5°C. Assuming ±5% uncertainty in ΣS0 and ΣS-II measurements and a pH uncertainty of ±0.02, error bars for Method II would fall within the area of the symbols. At 400 m and deeper, aS0 was calculated from greigite solubility using data from a May 2008 cruise ; error bars depict only measurement uncertainty and are based on an assumption that ΣFeII and ΣS-II are measured to ±5% precision and pH to ±0.02. Log Kgreig = 2.24 was chosen to make the two methods agree at 400 m.
Thus if aS0 = 1.0, then (Eh-EAg2S) would be +0.204. Over a wide range in both Eh and EAg2S, Berner observed (Eh-EAg2S) values falling within a ~0.05 V-wide band that was consistent with aS0 values within an order of magnitude of unity; most samples were characterized by aS0 < 1. In experienced hands, Pt electrode potentials can produce aS0 values consistent with Method II. For example, the data of Boulègue et al. from the pH 6.9 spring K22 at Puzzichello, in Corsica, yield aS0 = 1.57 and aHS- = 0.00063 M by Method II. From equation 16, this is consistent with Eh = −0.161 V, which compares well with the measured Eh of −0.155 ± 0.010 V. The small colloidal S0 supersaturation indicated by aS0 > 1.22 probably represents a perturbation induced as the water emerged from the subsurface . However, in other cases Eh calculated from equation 16 is inconsistent with measured Eh for reasons still unknown. The inconsistencies might point to fatal obstacles associated with attempting Eh measurements in sulfidic natural waters. Alternatively, they might simply testify to imperfections in the available data (for example, Boulègue and Michard  note that at near-neutral pH it is usually necessary to equilibrate Pt electrodes for several hours to get reproducible readings—something that is hardly ever done in the field). In the lefthand panel of Figure 6, aS0 has been estimated by Method II in the Black Sea, and in the righthand panel, Eh values implied by the aS0 values are crosschecked against some old Eh measurements. Qualitatively the Eh profiles show similarities, but quantitatively, agreement is poor. Unfortunately, some of this poor agreement might be due to temporal changes in the Black Sea, because the datasets being compared were not obtained contemporaneously. Black Sea data. Left: aS0 calculated by Method II (data ,). The total S0 data in  were assumed to represent dissolved ΣS0 because particulate S0 at these depths is negligible . Right: Eh measured by Skopintsev (quoted in ) compared to values calculated from aS0 by equation 15. Open triangles are based on evidence for colloidal S0 saturation at the top of the sulfidic zone . A key limitation of Eh measurements is their inherent imprecision; a typical measurement uncertainty of ±0.01 V corresponds to a factor of two uncertainty in aS0. Nevertheless, Eh is extremely attractive as a possible screening method for aS0 in natural waters because it can quite easily be deployed in situ, avoiding risks of oxidation, H2S(g) loss, S8 sorption and pH shifts that can occur when samples must be withdrawn from sulfidic environments for analysis. Additionally, because Eh is in principle a thermodynamic property, it should be unaffected by S0 colloids. Because of these attractive characteristics, further research on this approach might be warranted. Range of a S 0 in Natural Waters. In addition to the aS0 profiles in Figures 5 and 6, a few isolated examples of aS0 values are presented in Table 1 in order to illustrate the range observed in nature. These values were all calculated by Method II. The first two entries in the table, Enghien-les-Bains and Puzzichello springs, are found to have quite high aS0, probably artifacts due to inclusion of colloidal S0 in the ΣS0 measurements. Independent evidence for colloids was indeed observed at those sites and attributed to oxidation of sulfide as the deep ground waters mixed with shallow, oxygenated ground waters prior to their emergence in the springs. Lower Mystic Lake deep water as well as pore water from immediately below the sediment-water interface in Lake Croche also have calculated aS0 above the colloidal S0 limit, hinting at the presence of colloids. Even though the Lake Croche samples were collected by a sophisticated dialysis method that should have excluded colloids exceeding 0.2 μm diameter, their low pH may have promoted post-sampling H2S(g) loss through the dialysis membranes (most polymers are extremely permeable to H2S gas). Such loss would cause a transient aS0 spike and possibly initiate colloid precipitation. Two pore water samples from Great Marsh, a tidal salt marsh subject to intermittent exposure to air, cluster near saturation with respect to colloidal and rhombic S. Although not shown, similar values can be obtained from an independent dataset acquired at this same marsh . On the other hand, pore waters from a Prairie Pothole lake, and bottom waters from Mahoney Lake are appreciably undersaturated with respect to both colloidal and rhombic sulfur and are seen to have aS0 in the range of deep euxinic basin waters (Figures 5 and 6). *When I or T were not reported, estimated values were used. †DOC = 10 mg/L assumed. In Lake Croche’s low-pH, low-sulfide waters, S8 is determined to be the major carrier of ΣS0, and in the presence of ≥5 mg/L DOC, most S8 will be associated with organic macromolecules. As a result, Croche’s calculated aS0 values are sensitive to DOC concentration. At the opposite extreme, because of Mahoney Lake’s much higher pH and sulfide concentrations, S8 is negligible relative to polysulfides, and its aS0 is consequently insensitive to DOC concentration even though Mahoney’s DOC is extraordinarily high (~800 mg/L ). From the derived aS0 and [HS−] values in Table 1, the concentrations of S8 and all polysulfide ions can be calculated easily from equilibrium constants (values compiled in the Additional file 1). Perhaps surprisingly, the concentrations of polysulfide ions are found not to be simply proportional to aS0 or to ΣS0. For example, in Lake Croche the calculated concentrations of polysulfides are all <0.002 μM; in contrast, in Mahoney Lake concentrations of S42− and S52− each exceed 20 μM. (The deep waters of Mahoney, and also Lower Mystic, are reported to have a marked yellow color, probably due to polysulfides.) The immense difference implies that a kinetic process dependent on polysulfide concentration, such as degradation of a pesticide –, would be >104 faster at the sediment-water interface in Mahoney than in Croche. A rate disparity this large would not be anticipated simply by inspection of either the aS0 or ΣS0 values in Table 1. Notice further in Table 1 the non-intuitive relationship between the concentration and the activity of zero-valent sulfur, ΣS0 and aS0. For example, high values of aS0 in Lake Croche are associated with very low ΣS0 concentrations, whereas low aS0 values in Mahoney Lake are associated with very high ΣS0 concentrations; direct proportionality between aS0 and ΣS0 does not occur. This behavior arises because the analytically measurable quantity, ΣS0, is not the concentration of a single chemical species. Rather, it is the concentration of an array of labile species that vary relative to one another depending on solution composition. Kamyshny and coworkers, using an approach related to Method I, found aS0 (which they designated the relative saturation level, RSL) of 0.61 to 0.77 in sulfidic well waters . In Wadden Sea tide pools , aS0 values were in the range 0.3 to 0.9. Curiously, these latter samples contained visual evidence of sulfur colloids even though aS0 < < 1.22. One possible explanation is that the colloids were composed of biogenic sulfur, a hydrophilic substance which is less soluble than both inorganic colloidal sulfur and rhombic sulfur. Biogenic sulfur particles produced by sulfide-oxidizing Thiobacilli are characterized by aS0 = 0.95 ± 0.02 at 21°C according to data of Kleinjan et al. as analyzed by equations 5 and 6. Probably these microbes enhance their energy harvest from sulfide oxidation by discharging a metabolic S0 product, possibly a long-chain polythionate , in which aS0 is lower than in colloidal or rhombic sulfur. Abiotically, this reaction is extremely sluggish under conditions near Earth’s surface (half-life of centuries ). However microorganisms are known to catalyze it at high aS0, high pH and low aH2S, recovering some of the trapped free energy ,. For the samples discussed in this paper, the available free energy is shown in Figure 7 based on the derived aS0 values. Figure 7 shows that disproportionation of S0 is uniformly exergonic in these samples, but only slightly so in the extreme case of Mahoney Lake. Free energy available per mole S 0 by disproportionation of S 0 to sulfide and sulfate. Based on data in Figures 5 and 6 and in Table 1 as well as . ΔGR has been plotted against log(aH2S) because most of the ΔGR variation in this dataset is due to variation in H2S. Zero-valent sulfur is shown to be thermodynamically unstable in all the samples; that is, disproportionation would produce a decrease in free energy. The sample at upper right, lying very close to the equilibrium line, is the extremely sulfidic Mahoney Lake sample. It should be noted that ΔGR values depend on how reaction 19 is written; some previous workers  write the reaction to produce one mole of SO42−, rather than ¼ mole, and consequently obtain ΔGR values four times larger. This arbitrary choice affects the values on the vertical scale but not the pattern of the data. For reaction 19, ΔGR0 = +30.124 kJ/mol . Disproportionation is only one path by which S0 can be consumed in anoxic environments. Abiotically, S0 can be scavenged by pyrite formation  and by forming covalently bonded organic sulfur compounds . Owing to their high aS0 (Figure 5 and 6), chemoclines manufacture much of the framboidal pyrite found in euxinic basin sediments . Microorganisms also can reduce S0 in reactions with hydrogen, methane and other organic compounds . Except near redox interfaces, lack of oxidizing agents curtails oxidative pathways of S0 consumption. In sulfidic waters these loss processes are opposed by production processes mainly involving both biotic and abiotic oxidation of sulfide by various oxidizing agents (FeIII, MnIII,IV, NO3−, NO2− and of course O2) ,. As Figures 5 and 6 suggest, these production processes are most active near redox interfaces where concentration profiles of oxidizing agents and sulfide overlap to a limited extent. If sulfidic waters occur at depths shallow enough to be in the euphotic zone, anoxygenic photosynthesis becomes a very important source of S0. In deeper waters of euxinic basins, sinking particles may be the principal ΣS0 source. Detrital FeIII-bearing particles that are too refractory to react quickly with sulfide as they fall through the chemocline will be one source . Particles may also carry S0, itself. Particle-borne S0 would include intracellular S0, flocs formed when hydrophobic S0 colloids coagulate with detrital and biogenic particles and S0 sorbed to such particles. Often, S0 from these sources accumulates in elemental form in sediments beneath sulfidic waters ,. Figure 5 indicates how these opposing processes play out in the Cariaco Basin. 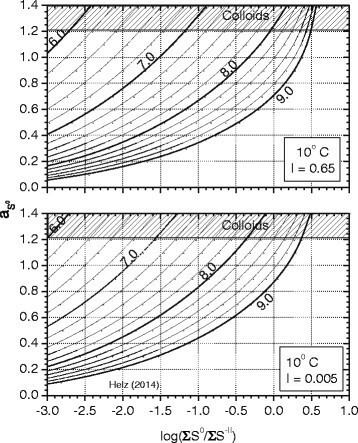 In the suboxic zone, owing to very rapid production of S0, the calculated aS0 reaches the limit imposed by rapid colloid precipitation; S0 accumulates in both particulate and dissolved forms . With increasing depth, aS0 declines, partly due to much lower production rates in the absence of oxidants and partly due to biological reduction. Sulfur isotope data, which arguably could imply active disproportionation in Cariaco’s deeper waters, are better explained by very slow sulfate reduction rates . Figure 6 suggests that similar processes occur in the Black Sea, but the data are incomplete. In passing, it should be noted that published polysulfide ion concentrations in the deep Cariaco Basin were calculated in ref  on the basis of the common assumption that aS0 = 1.0. At 400 m in the Cariaco Basin, the calculated S52− concentration was 0.53 μM under this assumption. Here, where aS0 is evaluated by Method II, S52− is calculated to be an order of magnitude less, 0.046 μM. This survey provides no evidence that natural waters tend to be buffered near aS0 = 1.0. Enormous errors can be introduced by making this seemingly innocuous assumption, and such errors can mislead assessments of polysulfides’ role in such processes as discussed below. Broader Geochemical Implications. Having for the first time estimates of the range of aS0 values in a variety of sulfidic waters, it is of interest to consider what these values imply about the geochemistry of elements other than sulfur. Here the effects of aS0 on trace element speciation and sulfide mineral stability are briefly discussed. The value of n, the number of sulfur atoms in the polysulfide ligands, has not been determined but is likely to be either 4 or 5. From published stability constants , the polysulfide complex is predicted to predominate at aS0 > 0.6 to 0.7 for n = 4 or 5. Thus the aS0 boundary separating predominance of the sulfide from the polysulfide complexes at neutral pH falls in the range of aS0 values found in natural waters. The Hg(Sn)22−/HgS22− ratio will increase steeply in proportion to aS0. Microbial Hg methylation, which is the entry point of Hg into aquatic food chains, is known to be sensitive to Hg speciation, with the polysulfide complex apparently not available for methylation ,. In contrast, the analogous boundary separating predominance of Ag(HS)2− from Ag(S4)23− lies at aS0 = 2.14 at pH 7 but falls to 0.96 at pH 8 (data from ,). Thus Ag(S4)23− is relatively less stable than Hg(Sn)22− and likely to be important only at higher pH in the range of aS0 found at earth-surface temperatures in nature. Similar calculations indicate that SbV thioanions will predominate over SbIII thioanions , and AsV thioanions will predominate over AsIII thioanions at aS0 values found in Table 1 and Figures 5 and 6. Although in both cases improvements are needed in the thermodynamic data, these predictions of the importance of oxidized thioanions in reducing natural waters seem to be borne out qualitatively by field measurements –. Reaction of S0 with MoOS32− in sulfidic solution produces an unstable Mo(VI) intermediate, MoOS(S2)22−, that undergoes spontaneous rearrangement to a Mo(IV) complex . This may be the initiation step in the scavenging of Mo from sulfidic natural waters and might explain the reduced oxidation state of Mo in sediments . From data in , the MoOS(S2)22−/MoOS32− ratio would reach 0.1 at an aS0 value in the neighborhood of 0.5, a threshold exceeded in most of the sulfidic waters surveyed in this paper. occurs at aS0 > 10-2.91 (taking log Kgreig to be 2.24 from this work and log Kmack to be 3.21 ). Realgar becomes unstable relative to orpiment at aS0 > 10-3.91. Chalcocite, djurleite and anilite all become unstable relative to covellite at aS0 > 10-2.29. Thus the aS0 values in Figures 5 and 6 and Table 1 all imply that in each of these three mineral systems the most sulfur-rich mineral (greigite, orpiment, covellite)) would be the stable sulfide mineral. The activity of zero-valent sulfur is an important property of sulfidic waters, but one that cannot be measured directly. Methods for determining it from measurable properties of natural waters have been reviewed here. A critical test of the two principal methods against one another yields inconsistent results when ΣS0/ΣS-II is low. The source of this problem appears to lie in the thermodynamic data, especially for disulfides. The inconsistencies largely can be removed by a pragmatic modification to accepted ionization constants for polysulfides, but this approach requires further investigation. A survey of aS0 in sulfidic natural waters yields values in the 0.3 to >1.2 range. Those values >1.2 are believed to be artifacts caused by inclusion of colloidal sulfur in ΣS0 determinations. In all of the surveyed environments, S0 is unstable with respect to SO42− and sulfide. In these environments, aS0 values are high enough to have a significant influence on the biogeochemical behavior of Cu, Hg, As, Sb, Mo and probably many other trace elements. The author is pleased to acknowledge the help of Andre Tessier and Feiyue Wang who checked some of the calculations and provided a review of the manuscript. Three anonymous reviewers also are thanked for their suggestions for improving the manuscript.